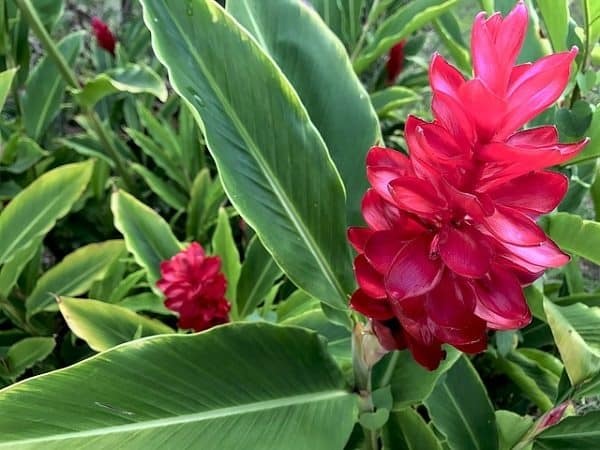 Ginger is an easy plant that you can grow if you live in a warm, humid climate. This tropical spice has quite a few medicinal benefits as well as packing a bunch of flavor in a small amount. Ginger can be expensive to purchase at the grocery store, so growing your own has financial benefits, as well as a fresh ginger flavor. In addition to learning how to grow ginger, we’ll also discuss some of the health benefits and a couple of recipes where you can use ginger. Ginger is a popular ingredient for cooking, but it also has many medicinal purposes that have been used for thousands of years. 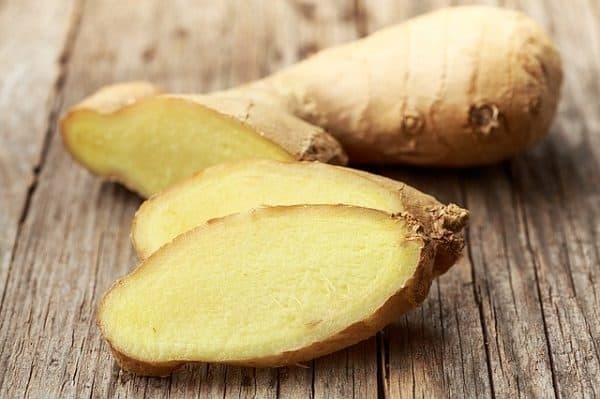 Ginger is good to have for flue and cold relief, as it helps to boost your immune and fight off infections. 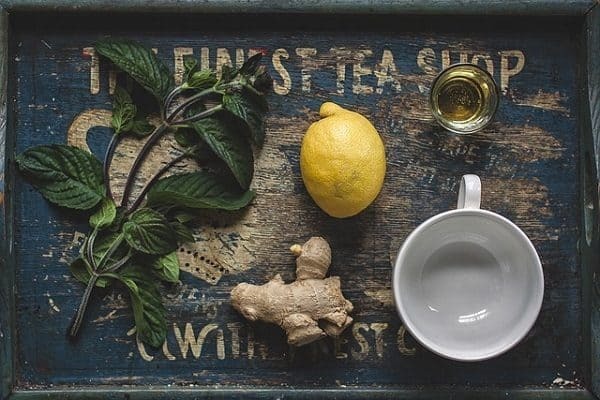 Ginger tea can be a soothing home remedy for when you’re not feeling well. This spice is antibacterial as well as anti-inflammatory, antifungal, and has antioxidants. Ginger helps to reduce nausea, pain, and inflammation. It can help with muscle pain from exercise, arthritis, and menstrual cramps. It also aids in digestion and relieves heartburn. Growing ginger is pretty easy if you live in a warm, humid location. It likes warm temperatures and humidity. Ginger grows well in areas that have a hardiness zone of 7 or higher. Here in Central Florida, the zone is 9b. It’s also humid here, so Florida is a good place to grow ginger, but you can grow ginger north of here as well. I would recommend starting in spring and growing in pots if you live up north so that you can bring your ginger in during colder months. When night temperatures start to dip below 50°F you should start bringing in your ginger plant. You can also mist your ginger if you live somewhere dry since they prefer humid climates. Ginger also likes shade, with only a few hours of direct sunlight in the morning or evening (not during the hottest part of the day). It also likes protection from the wind. For me, keeping ginger in a pot on my front porch that faces east is a great location. To get started you can use organic ginger from your local grocery store or food market. Ginger is a rhizome, also called a creeping rootstalk. This means it has an underground plant stem which is capable of producing the shoot and root system of a new plant. When you select your ginger, you’ll want a piece that looks plump and has multiple bumps or nubs. These are where the new stems will grow. 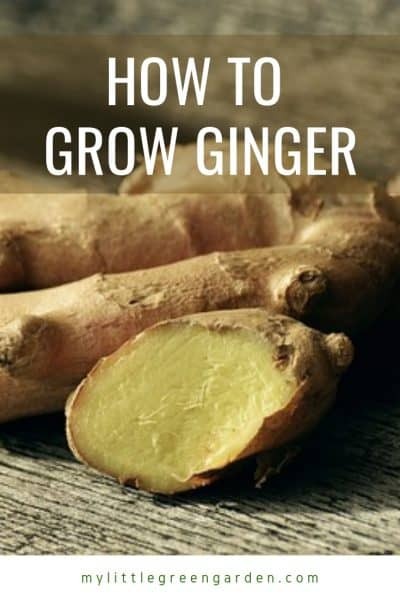 You can break your ginger into pieces to grow multiple plants, just make sure each piece is at least an inch or two long and has at least one nub. If you find you have an older piece of ginger that’s already starting to produce shoots, you can also plant these pieces. Since I regularly purchase ginger, I found I already had a couple of pieces growing that I wanted to plant. You’ll want to soak your pieces for a few hours before planting. You can soak them overnight if you wish. 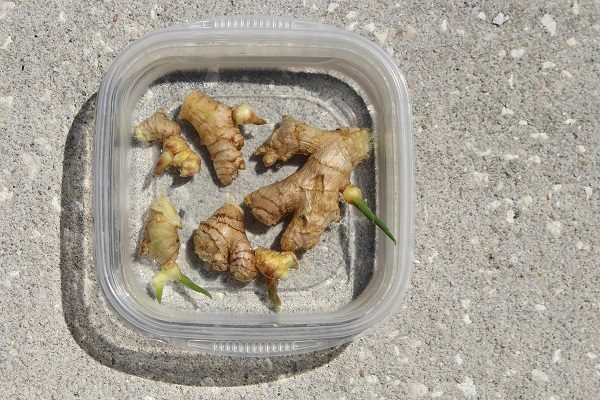 Once you’ve soaked your pieces of ginger you can plant them. Use a pot with a decent amount of drainage holes. Fill it with potting soil and compost and then plant your ginger with the nub end pointing up. Make sure it’s completely covered, planting the ginger root about an inch deep. Water your pot until water starts to flow out of the bottom. 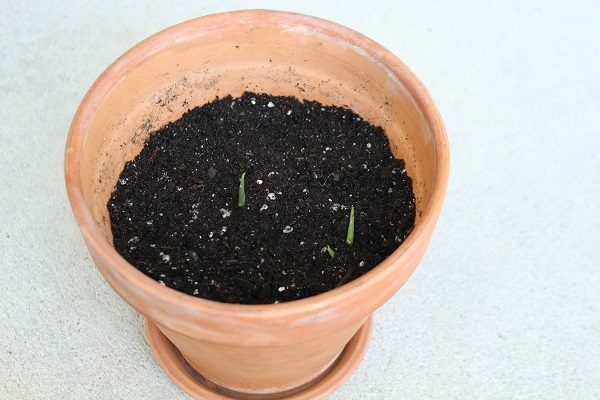 You can start with a small pot and transplant your ginger later, or plant it in a larger pot from the start. A pot with at least a 14″ diameter should give you enough room to grow a decent amount of ginger. You’ll want to water your plant regularly. Let the top two inches of soil dry between watering to prevent rotting. In 2 to 4 weeks you should see the ginger root start to sprout. After 3 months your plant should be about two feet tall. You will also start to get multiple shoots. After the plant is about 4 feet tall you can start breaking off pieces of the root. It takes about 6 to 8 months before your ginger plant is ready for you to start harvesting. 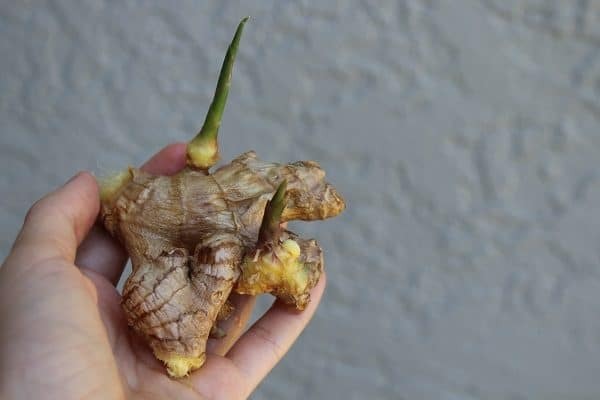 Take care to only harvest outer pieces and leave part of the root still in the ground so that you’ll continue to grow your own ginger. Once you get started growing your ginger it doesn’t take as long to harvest additional pieces. If you’re interested in growing flowering ginger, this is a different variety of ginger compared to culinary ginger. Both types grow the same way, but culinary ginger flowers are not as spectacular as the kind shown below. Flowers take about 2 years to develop on a mature plant. Ginger can be used fresh, dried, as a powder, or oil. It’s typically used in Asian cuisine. You can use it in chutneys, stir-fries, curries, soups, desserts, teas, juices, and more. Ginger is a spice that’s hot, zesty, and a bit sweet. The two recipes below are quick and easy to make beverages that are healthy and allow you to absorb the benefits of ginger. I drink carrot juice almost every morning these days with our Omega Juicer. It’s a great way to absorb nutrients quickly. And while some might say that carrots are high in sugar, I find that a glass of this juice in the morning curbs any sweet tooth I might have throughout the rest of the day. Place all of the ingredients through your juicer. After you’ve juiced all of the ingredients, stir the mixture and serve over ice. Ginger tea is a soothing herbal tea. This is great if you have a cold or flu. The additional ingredients of lemon, honey, and mint are also good for illness. Put ginger, sliced lemon, and water into a pot and bring to a boil. Add mint and let simmer for 10 minutes. 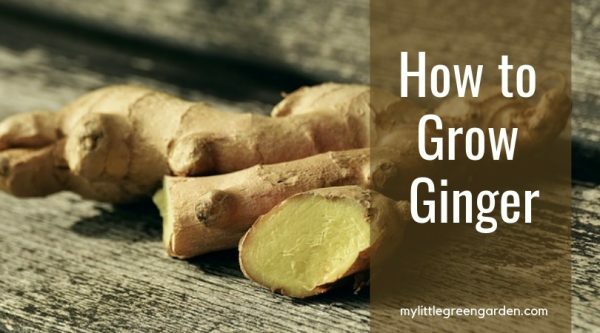 How do you use ginger? Comment below!